This large rare bronze souvenir building inkwell of the Pantheon in Rome recently sold on eBay. 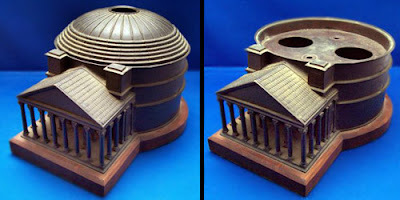 The dome lifts off the 8-inch tall replica to reveal two inkwells and inside are three small sphinx-like figures against the walls. A souvenir of the Grand Tour, it weighs over 6 lbs. and the base is solid mahogany. A similar piece was dated as 3rd Quarter of the 19th century. This souvenir recently sold on eBay for a whopping $1,955.00. The real Pantheon, which means "Temple of all the gods," dates from about 125 AD and is the oldest standing domed structure in Rome. The building is circular with an entrance portico of three rows of granite corinthian columns. Inside, the rotunda is a coffered, concrete dome with a central opening.